April is HERE and the My Memories Blog Train has left the station. This month the featured theme is Heirloom Treasures. You’re going to love the vintage feel. Go ahead and grab all of my gifts and then roll on down the tracks and pick up gifts from a long list of other amazing desginers! Ahhh… Heirloom Treasures! Great for genealogy Scrapbooking. Perfect for any vintage photos and perfect for other creative projects like print and cut greeting cards, or dressing up your social media covers. 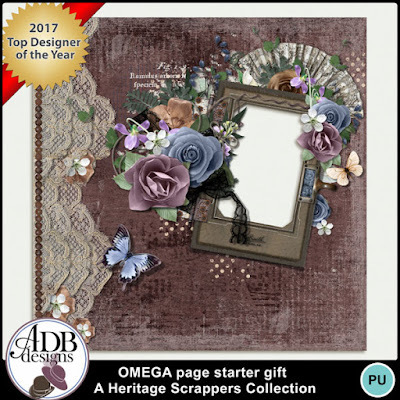 The Heirloom Treasures Mini Kit features 3 papers, 1 deco banner, 1 ribbon, 2 flowers, 1 frame, and 1 gently aged tag. If you LOVE Heirloom Treasures, you’ll also LOVE the Somewhere Collection. Somewhere features a similar palette in gentle golds, bold reds, and touches of teal. You can pick up each of the SIX coordinating gifts in my shop at My Memories. Each gift is FREE but don’t tarry. My Memories Blog Train FREEBIES are only available through the end of April. 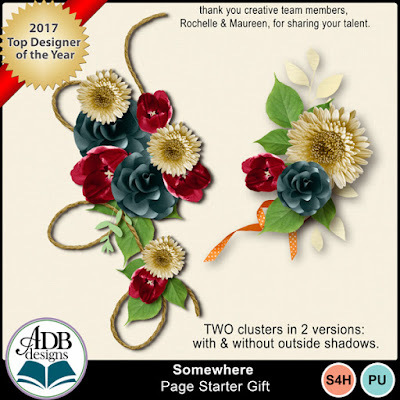 Join me in The Vintage Romantic Challenge and Get this Omega Cluster Page Starter for participating. Each month I give two prompts to help you document your life. Each post contains a gift to help you scrap your own life story. This week, you can pick up two clusters that coordinate with Somewhere. ADB Designs <<< YOU ARE HERE ! The award-winning My Memories Suite software has just been updated and the latest release is awesome. It is a fun and easy way to create scrapbooks, photo books, prints, custom gifts, and more! The March My Memories Blog Train is rolling down the tracks. Spring is in the air and the featured theme is Morning Glory. If you LOVE bright pinks and glorious greens, If you’re ready to scrap Easter photos or just longing for some bright patterns and solids for an old black and white photo, I think you’ll be excited about this special mini kit and paper pack. The mini kit includes a paper frame, flower, green leaf, cross sticker, ribbon and 3 pattern papers. Pick up the extra paper pack and you’ll have 12 gently decorated papers. Combine these with the kit papers for beautiful stacked pages, framing your photos or create your own journal cards for titles or telling your family story. I LOVE giving you Gifts to add a little scrapbooking LOVE to your day! ~ These gifts will be FREE along with the Blog train mini thru the end of March. This month, I’m featuring clusters, stacked papers, and quick pages that coordinate with some of my most recent releases. I designed these to work as a stand-alone gift but I’m also providing a link to the kits and bundles in case you missed them when they released. Join me in The Vintage Romantic Challenge and Get this Hygge Stacked Paper Page Starter for participating. Welcome to the FIRST My Memories Blog Train of the new year! Winter Blues is the theme. 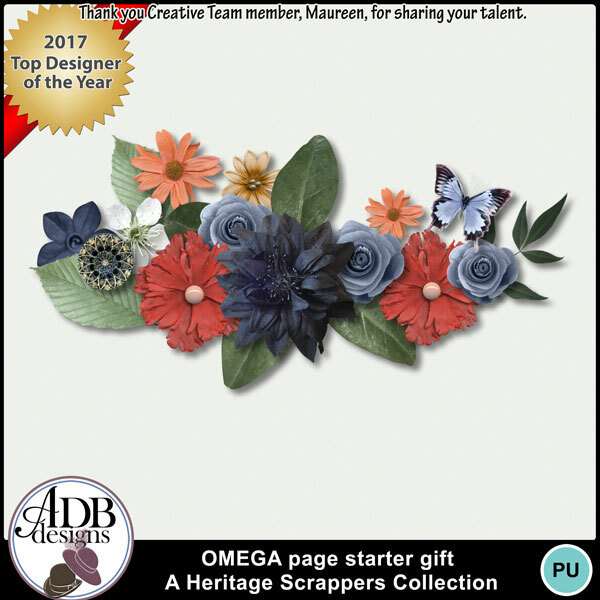 It is fun and full of bits and pieces that will work on just about any scrapbook page. Be sure to read the entire post. There are links to 15 Gifts! This is a fun little mini kit. If you’ve already scrapped all of your winter photos, this is a great little mini for making gift tags or Christmas ornaments for next year. Click on the previews to go to my store and add these to your shopping cart. I LOVE giving you Gifts to sweeten your day! ~ These gifts will be FREE along with the Blog train mini thru the end of the month. Join me in The Vintage Romantic Challenge and Get this Winter Fun Cluster for participating. Be sure and read the entire post, there are links to a total of 11 gifts! My November Blog Train contribution is Dazzle. It is a tribute to Autumn with the dazzling colors and constant changes. You will love the Mini Sampler and delicately textured cardstocks. Click on the Previews to go to my store and add these to your shopping cart. I LOVE giving you Gifts to sweeten your day! ~ These gifts will be FREE along with the Blog train mini thru the end of the month. I have been listening to what everyone says about what gift is the best; I will keep working to include more of what you like best in the future. Feedback is welcome; leave me a comment telling me your favorite(s). This month, in addition to the Dazzle products, I have some wonderful gifts that coordinate with some of my recent releases. I am also featuring this Paisley Quick Page as part of my Documenting Your Life series. The image is linked to my November post. I would love to have you join me and Document YOUR Life with one of many journaling prompts.